Included in Love, Chunibyo & Other Delusions! DVD/Blu-ray Complete Collections as a 22 min Extra entitled Chuni-Shorts. Parent story: Chuunibyou demo Koi ga Shitai! Phenomenal, Hilarious, Entertaining, and probably one of the first 30:00 of a mini series (combined in total) that I sat through and continue to adore. Tbh, I never liked youtube that much but this right here, my friends, has given me a new light of hope. Chuunibyou demo Koi ga Shitai! Lite is an alternative adaptation of its parent story, Chuunibyou demo Koi ga Shitai! (Regardless of My Adolescent Delusions of Grandeur, I Want a Date! Lite) that debuted before the original series. It's like a little preview, or a foreplay before the real thing begins. The series debuted as short episodes aired on KyoAni's official YouTube channel. While the series doesn't stand out much on its own, it was entertaining. No. I'll say it again. It's bloody entertaining. Some of the main characters make their cameos in this mini series. We got the one eye patched girl Rikka Takanashi, the main heroine who has apparently made a contract with Togashi Yuuta. She also has this interesting eye behind that eye patch known as the "Wicked Eye" that looks somewhat like Laura from IS. No, screw that. 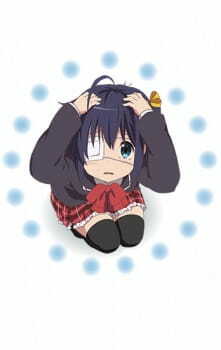 Rikka's eye is wicked, beat that! Yuuta also makes his appearance as well. He is a young boy who believe himself...as Dar-. Well, actually I'll leave you to check out the real series for the more detailed info. He has some funny instances in this mini series. Other characters also get their spotlights as well like Shinka and Yumeha. Despite their relative short appearances, it's entertaining to see them doing what they do. Hell, even watching Kumin "Pillow Senpai" Tsuyuri doesn't make me want to sleep and grab a pillow. No. This series did not put me to sleep at all. The artwork of the mini series is still generally the same as its parent adaptation. Like daughter, like mother, the moe like faces of characters and KyotoAni's glorious animation are there. Remember Hyouka's art this year? Ya, you get the idea. As for the music, it's comedic and remains most of the same. No, wait. The OP song "Kimi e (君へ)" by ZAQ is different! It didn't give me an eye seizure like the original series but instead was dramatic. The ED however was...oh God, how do I even describe it? Search up the word "cute" on thesaurus.com and you'll get a general idea. Overall, this lite series was a delight for me. There's not much of a story but who cares when you got delusions, comedy, and the cast that KyotoAni presents to us. All in all, Chuunibyou demo Koi ga Shitai! Lite is a "8" in my book. I'm probably overpraising this but for a 30:00 of a series, this was just...phenomenal. If Chuunibyou demo Koi ga Shitai! is the sandwich then Chuunibyou demo Koi ga Shitai! Lite is the side order of fries that goes with it making it more enjoyable. Chuunibyou demo Koi ga Shitai! Lite is nothing more than 5 or 6 minutes of pure comedy which basically shows the relationship of all the main characters. There really isn't much more to it than that. If you enjoy Chuunibyou demo Koi ga Shitai! and have a few minutes extra to spare and want a good laugh then you will get it with Chuunibyou demo Koi ga Shitai! Lite. Not a lot of story here in terms of really driving and engaging stuff however this half hour mini series is like a little cherry on top of an ice cream. I thoroughly enjoyed it and since the Chuunibyou series is one of my favorites of all time you can expect me to be a little biased here. Love the art style and how upbeat it is, very bright colors, super happy environment, this anime is a little bundle of joy. The background music and sound effects are the only sounds throughout this series since there isn't really an opening however they truly compliment this mini series and make it that much more enjoyable to watch. Although extremely cringy at times I love these characters, these characters make the perfect slice of life and romance anime characters I have ever seen. No new characters are introduced here but what I love is seeing a younger Rikka and a younger Yuuta, plus getting to see more out of Kumin's character. Watched this whole series in the middle of one of my calculus classes, gotta say it made time go by much faster. Although the series is small it does a good job of giving you a little more just to keep the dream alive of one of my favorite animes. I wouldn't recommend you watch this series without having seen the first season of Chuunibyou first.